This walk covers the Reston Association marked trail between Lake Anne Plaza and Fountain Square at Town Center. It returns to Lake Anne via an alternate route including Old Reston Avenue and the original route of Temporary Road. Reston Avenue, Temporary Road, and Sunset Hills Road have gone through several changes. To view these changes click here. 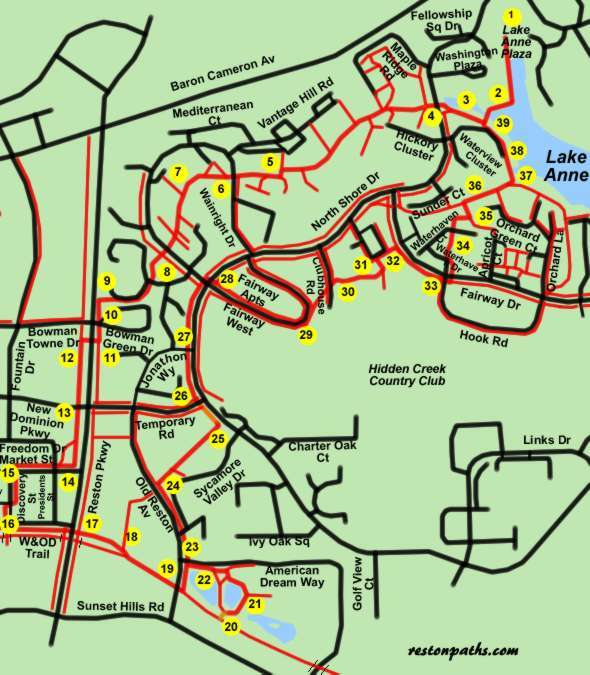 The Reston Association has marked a trail between Town Center and Lake Anne to assist visitors in walking between these points. This walk will utilize that trail to walk from Lake Anne to Town Center but will return via an alternate route to view more of the area. The walk starts from the parking lot of Lake Anne Plaza. A farmers market operates out of a portion of this lot on Saturday mornings during the growing season. Walk from the parking lot to the plaza and keep to the right of the lake walking towards the fountain in the lake. Turn right to follow the asphalt path along the inlet to the lake. There are many lovely gardens in this area. The path crosses a bridge over the inlet. Turn right to continue following the water after crossing the bridge. The path will eventually follow along the edge of the water where it passes under North Shore Drive. After crossing under North Shore Drive continue straight on the wide asphalt path. Do not turn onto the many intersecting paths to the right and left. Just after passing a tot lot the path turns slightly to the left to cross a creek. It then turns to the right to continue following the creek. The path crosses Wainright Drive. Continue straight on the path on the other side. An athletic field can be seen on the left of the path. After the path reaches the top of the hill it turns slightly to the left. The path crosses the second appearance of Wainright Drive. Stay straight on the path through the short wooded stretch and across the parking area. Turn left when the path reaches Reston Parkway. The path crosses Bowman Green Drive. Continue on the path along Reston Parkway. Turn right into the tunnel under Reston Parkway after walking a short distance from Bowman Green Drive. After leaving the tunnel turn left to follow a sidewalk along Reston Parkway. Cross New Dominion Parkway and continue on the sidewalk along Reston Parkway. At the next asphalt trail intersection the official path continues to the left. The path to the right is a shortcut across the park. The official trail turns right at the next intersection (Market St.) and follows the sidewalk along that road. Fountain Square in Town Center will be reached after walking 2 short blocks along that road. This is the Town Center end of the official trail. Concerts are held in the Pavilion in Fountain Square on Saturday evenings in the summer. The Navy Band Commodores are shown performing. Turn left to follow the sidewalk between the hotel and the pavilion. After passing the pavilion continue straight using the sidewalk on the right hand side of Discovery St.
A walkway crosses the W&OD Trail on a bridge at the end of Discovery St. Turn left prior to the bridge and follow the trail along Bluemont Way. The walk crosses Reston Parkway at the end of Bluemont Way. Continue walking straight on the asphalt path on the other side of Reston Parkway. The path joins the W&OD Trail. Continue straight on the trail. The path passes a gazebo on the left and then crosses Old Reston Avenue. During warm weather it is suggested that you continue via step 20 in the instructions in order to view the gardens at Fannie Mae. Otherwise, turn left to follow the sidewalk along Old Reston Avenue and continue at step 23 in the instructions. The shortcut will take about 0.2 miles off the walk. Continue walking along the W&OD Trail until you see a circular asphalt path on the left. Turn onto the path going only half way around the circle. There is a short dirt path connecting to the grounds of Fannie Mae at that point. Turn right onto the path inside the Fannie Mae grounds. The path circles a pond on the left with many attractive plantings on all sides. Another section of this site provides a better view of the many attractive plantings at Fannie Mae. Follow the paths until you reach the sidewalk along the rear road into Fannie Mae. Turn left to follow that road (American Dream Way) past the gate to Old Reston Avenue. Turn right onto the sidewalk along Old Reston Avenue. Follow the sidewalk up the hill along Old Reston Avenue. The building on the right is a historic structure. Turn right at the pedestrian crossing sign onto the wide asphalt path. This path marks the location of the original Temporary Road that connected North Shore Drive and Reston Avenue. Stay straight on this path. The path passes a picnic area on the left. After reaching North Shore Drive turn left to walk on the grass a short distance to the new Temporary Road. Cross Temporary Road and follow the sidewalk on the left side of North Shore Drive. Cross Jonathon Way and continue on the sidewalk along North Shore Drive. After crossing Wainright Drive turn right and cross North Short Drive. Continue straight on the other side following the sidewalk along Fairway West. Fairway West starts to turn to the left to return to North Shore Drive. Cross Fairway West and turn left on the sidewalk on the other side of that road adjacent to the golf club. The sidewalk leads into an asphalt trail heading into the trees behind the apartments. The trail crosses Clubhouse Road. Follow the trail to the right of the houses on the other side of Clubhouse Road. The trail passes along the side of the golf course until it reaches more homes on the edge of the golf course. Turn right along the sidewalk on the edge of the parking area. The sidewalk becomes an asphalt path leading to the sidewalk along Fairway Drive. Continue in the same direction as the asphalt path going east along Fairway Drive. After crossing Hook Road turn left to cross Fairway Drive. Follow the sidewalk along Waterhaven Drive. Turn right onto the asphalt path leading past the gazebo. The path leads to a parking area at the end of Waterhaven Court. Cross the parking area and take the asphalt trail between the houses and down the wooden steps. Turn left at the next asphalt trail intersection. After walking a short distance down the hill turn right onto the next asphalt trail intersection. Turn left at the next wide asphalt trail intersection. Lake Anne can be seen on your right. The trail leads into a sidewalk through Waterview Cluster. Continue along the sidewalk. The sidewalk turns right and goes down a steep hill. The trail crosses a wooden bridge across an inlet to Lake Anne. Continue back through Lake Anne Plaza to the parking lot where this walk started.